The Oak Bay Beach Hotel is excited to unveil their calendar of festive seasonal activities and events to complement the luxurious and relaxing experiences offered at Victoria’s landmark ocean view resort. With Tuesday Christmas Movie Nights, the Best Christmas Gift, the annual New Year’s Eve Gala, and so much more, the Oak Bay Beach Hotel is sure to be the perfect antidote for any anxiety the holiday rush may bring, both for guests and locals alike. He’s making a list and coming to the Oak Bay Beach Hotel to check it twice. Due to overwhelming demand, additional dates have been added for the Oak Bay Beach Hotel’s Breakfast with Santa. 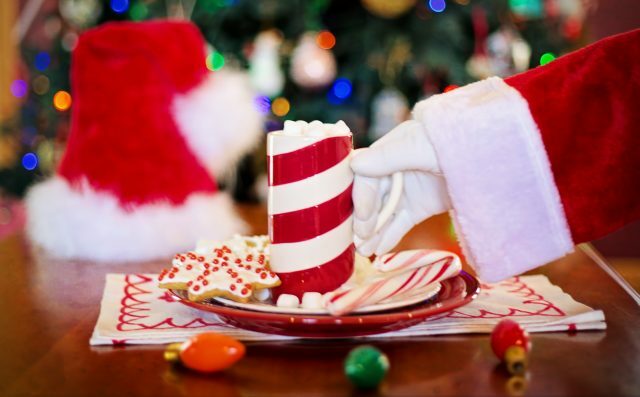 This festive breakfast will include house-made cookie decorating at each table, a visit from Mr. Claus himself, as well as an interactive photo booth from Four Frames Photo Booth so you can bring the merry memories home. Order a warm drink and take a cozy front row seat on Kate’s Café’s patio to watch the magical Lighted Truck Parade while enjoying music from a local band. Christmas Movie Nights will be returning to the Oak Bay Beach Hotel in the David Foster Foundation Theatre, with favourite holiday films accompanied by light theatre fare. Films will include Love Actually, Elf, and the Polar Express. From 11am to 4pm daily, enjoy complimentary hot apple cider, created using Chef Kreg Graham’s family recipe, as you settle down in front of the cozy fireplace in our decorated Grand Lobby and enjoy the wintery seaside views. The Magic of Christmas, with Michael Sicoly and friends. For a live mix of comedy, music, sing-alongs and more, look no further than the Oak Bay Beach Hotel’s holiday-themed variety show – The Magic of Christmas, with Michael Sicoly and friends. Sip bubbly during the cocktail reception, enjoy a specially curated three-course dinner as you experience the magical creations of Michael Sicoly, indulge with dessert, and finally, end the evening with rich hot chocolate and house-made cookies. Make sure to reserve your seats in advance to join the Oak Bay Beach Hotel family in celebrating a warm-hearted Christmas Day Brunch with a lavish fine dining experience, including a carving station and all the works, created by Executive Chef Kreg Graham. Start a new tradition with your family or continue an old one by joining us for a traditional Christmas Dinner served in both the neighbourhood favourite Snug Pub as well as our intimate seaside Dining Room. Christmas Day Brunch in the Grand Lobby – Four seatings between 10:00 a.m. and 12:30 p.m.
Tickets: Adults: $75* / Children: $30* / Children 4 and under complimentary. Christmas Dinner in the Snug – Two seatings at 5:00 p.m. and 7:30 p.m.
Christmas Dinner in the Dining Room – A table d’hote dinner with reservations beginning at 5:00 p.m.
Ring in the New Year in style at the Oak Bay Beach Hotel’s annual New Year’s Gala. Enjoy a welcome glass of bubbly at the cocktail reception followed by a multi-course gourmet dinner, then dance the night away with a live band until the clock strikes midnight! Deciding on the perfect present for those closest to you? The Oak Bay Beach Hotel is excited to announce The Best Christmas Gift, with Michael Sicoly. A multiple performer, super interactive show, this event will include a glass of complimentary bubbly, a three-course dinner, dessert, and cookies and hot chocolate as you depart.